MMS DECEMBER 2018 60 mmsonline.com GRINDING Keep Calm and Continue Grinding In production grinding, it is not always possible to correct a vibration problem as soon as it begins to appear. Rather than stopping, here is a means of continuing to realize smooth, efficient grinding until the underlying cause of vibration can be addressed. 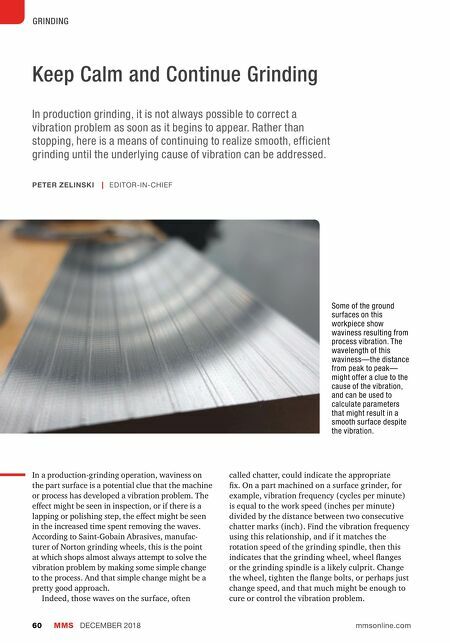 In a production-grinding operation, waviness on the part surface is a potential clue that the machine or process has developed a vibration problem. The effect might be seen in inspection, or if there is a lapping or polishing step, the effect might be seen in the increased time spent removing the waves. According to Saint-Gobain Abrasives, manufac- turer of Norton grinding wheels, this is the point at which shops almost always attempt to solve the vibration problem by making some simple change to the process. And that simple change might be a pretty good approach. Indeed, those waves on the surface, often called chatter, could indicate the appropriate fix. On a part machined on a surface grinder, for example, vibration frequency (cycles per minute) is equal to the work speed (inches per minute) divided by the distance between two consecutive chatter marks (inch). Find the vibration frequency using this relationship, and if it matches the rotation speed of the grinding spindle, then this indicates that the grinding wheel, wheel flanges or the grinding spindle is a likely culprit. Change the wheel, tighten the flange bolts, or perhaps just change speed, and that much might be enough to cure or control the vibration problem. PETER ZELINSKI | EDITOR-IN-CHIEF Some of the ground surfaces on this workpiece show waviness resulting from process vibration. 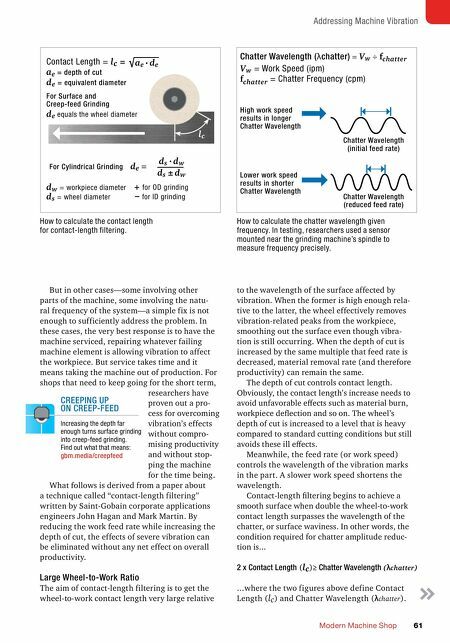 The wavelength of this waviness—the distance from peak to peak— might offer a clue to the cause of the vibration, and can be used to calculate parameters that might result in a smooth surface despite the vibration.